This past weekend I finally got a chance to play “Quarriors!” The game was originally published in 2011, but I figured it’s never too late to learn how to play. As a fan of deck building games, the idea of replacing the cards with dice was all too good not to pass up. With dice, there is an added element of chance; something you don’t get with cards. Cards have an exact face value while there are six sides to a die. For those of you who don’t know, “Quarriors!” is a dice-building game, for 2-4 players, that was designed by Mike Elliot and Eric Lang, and was published by WizKids. They’re the same company that has put out other games such as “Mechwarrior” and “Heroclix.” Since its release, there have been four other expansions. 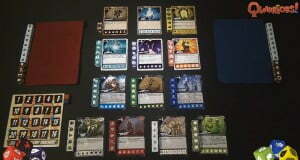 The latest one was “Quarriors! Quartifacts” which was released in 2013. If you’ve ever played a deck building game, then learning how to play “Quarriors!” should be really easy. The only obvious difference here is that you play with dice. Never played a deck building game, don’t worry. The rule book reads well and flows well. It also gives great examples of some of the more complicated stuff with player scenarios. The rule book also comes with handy “play mats” if you need help visualizing your playing field and the steps of the game. Once you and your friends have a feel for the game, things will really begin to pick up. 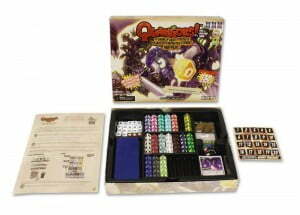 “Quarriors!” is a really fast paced game. So don’t worry if your sessions are only lasting 20 minutes. Depending on the number of people playing, the sessions may last a little bit longer. If you feel the game is going by too fast, though, the rule book contains additional rules to prolong the game for a more lasting experience. Learning the game with some deck building experience should take about an hour. For learning the game with no deck building experience, give yourself at least a couple of hours. Obviously, the best feature of the game are all of the dice. As a gamer, dice are my weapon of choice and almost essential in every game a person plays. This game, however, takes that to the extremes. How the games works is each player starts with a total of 12 dice. Eight of them are “quiddity” and four of them are “assistant” dice. Quiddity is what the currency in the game is called and what you will need to purchase or “capture” other dice in the “wilds.” The “wilds” is just another name for the area where the creatures and spells available for “capture” (or purchase) are. As the game progresses, you “capture” dice to add to your collection. Along the way you summon monsters and cast spells. The monsters you summon are what gain you glory. In a two-player game, the first person to 20 glory wins; for a three-player game, the first to 15 glory wins, for a four-player game, the first to 12 glory wins. The dice, in general, look cool. It may not seem like it, but this is important. No one wants to play an ugly game. If you were to walk by this game, there’s a good chance it’ll make you stop and wonder what’s going on at the table people are playing. Just as the header states, each game is slightly different. The game contains five spells, but four different versions of each one for a total of 20 spells. Likewise, there are ten different creatures, but three versions of each one for a total of 30 creatures. Add the three basic cards and you have a total of 53 cards. Why does this matter? Well, for each game, aside from the three basic cards, you’re required to play seven creatures and three spells. With all the different versions, this means each game is a little bit different from the other. I’m sure there is a set number of combinations here, but I am terrible at statistics, so you can figure that one yourself. In case you were wondering, there are a total of 130 dice. The game also comes with one glory tracker, a rule book, and four cloth, dice bags. When I bought the game, my first concern was with the quality of the bags. I was concerned they were going to be made out of a paper material. However, these bags are made of a decent material. I would even consider using them as general dice bags. The only bad thing about them is that my hands are too “meaty” to fit into them. They still do the job, though. I’m sure a lot of you are also concerned about the storage of the dice. Have no fear because the box makes for a really impressive storage unit. The way the box is configured, you can fit all of the creature and spell dice with extra room to spare on the first level of storage. Then there is a plastic cover that also makes for another level of dice storage. This is really convenient if you want to store all of the expansions and core set together. The inside of the box doubles as a sweet storage unit for the dice! I really enjoyed this game and can’t wait to play it with other friends. 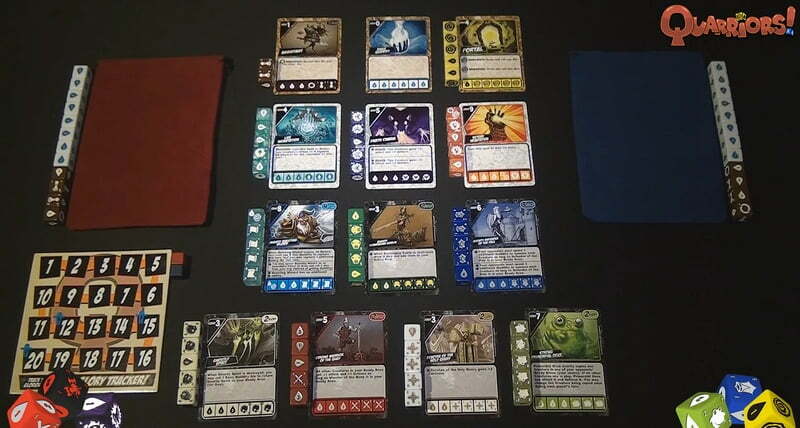 I learned the game with my brother who is another big fan of deck buildings games. When I explained that this was almost the same thing, but with dice, he was immediately interested. An unfortunate thing is that some of artwork on the dice seem to be faded. It says a lot about the production of the game. It’s a little annoying to have to hold some of the dice close to my face in order to read them, but it’s something that I have no problem overlooking. My overall enjoyment of the game is enough to make me shrug off an issue like that. Even if you haven’t played a deck building game, this is one I highly recommend, and if you have played a deck building game, then this is one you should definitely own. 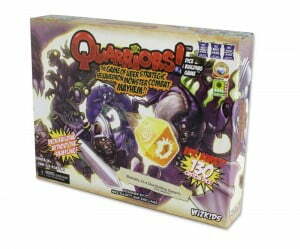 “Quarriors!” is available for purchase at Battleground Games & Hobbies for $50. It’s a popular game, so make sure you call ahead to see if it’s in stock. If not, then the store can easily place an order for you. That’s it for now. If you think I left something out or have a comment, then leave one below. Thanks for reading. PS. 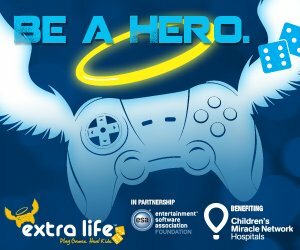 Stay tuned for a special give away I’ll be doing for the Extra-Life fundraiser. For more information or the chance to donate, then click on the link below.